Since leaving TVB, Yoyo Mung (蒙嘉慧) collaborated with rival company HKTV. Although HKTV showed promise in their quality productions, the station was plagued by broadcasting issues. Without clarity on when its productions will be able to air online, HKTV has halted the filming of its drama productions as its future remains unclear. 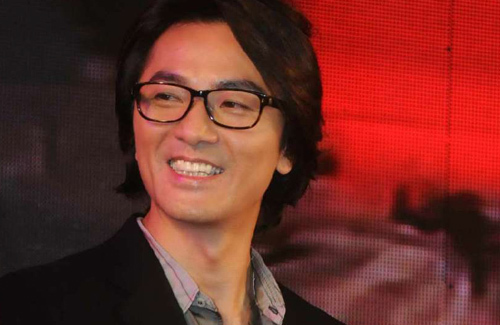 Yoyo’s husband, Ekin Cheng (鄭伊健), spoke out about the unfairness of situation. Aside from his concern for Yoyo’s future, Ekin is also worried about fellow colleagues who just want to continue their acting work. Although he is already 46 years old, Ekin’s popularity has not died down. In terms of his career, Ekin hopes to film a movie similar in concept to Korean drama, My Love from the Star <來自星星的你>. Continuously accepting one job after another, Ekin has no plans to slow down his career. He disclosed that he lacks free time, and does not want his future children to be upset at him for not spending time together. Ekin does not worry about having children at a considerably older age because of modern technology. The choice of in-vitro fertilization is a viable option in Ekin’s mind. He’s 46 and YoYo in her late 30s. Surely it’s a good time to have a kid. What wait till he’s 50 something? By the time the kid finish Uni he’ll be in his 70s! You want to be able to play sport with your kids. Go on travelling and stuff. I know someone who had his first kid went he was 48. The kid is 7 this year. He went to school with the kid for an event and the teacher asked whether he was the grandfather!!! I think it is very clear neither wants children. The only negative news I heard about Yoyo involved a child actor who obviously dislike her. Her biological clock is ticking, at 46, most men children would have been in their early teens if not young adult. Granted medical technology has advanced, but what kind of quality time would you have with your teenage children when they want to do certain things and your age and health prevent you from enjoying that quality time with them? I mean your child is 18 and graduating from high school and you’re getting ready to hit retirement. Or when you they are late 20s early 30s and started to have their own children, will they have what it take to enjoy the grand children? Whether the Chinese article got lost in translation or not, there’s one fact that is true. Ekin does not want to have children as ‘he has no time to spend with them’. At 46, he has already made his millions and still popular but the old saying ‘the greed for money is the root of all evil’. Maybe he’s still hoping to win a movie award or something but it’s quite clear that he won’t. He can still pursue his acting/singing career while Yoyo can supervise the children. It’s not like he doesn’t take breaks after each project. And Yoyo only go along because she knows her biological clock is tick, tick, ticking….. I hear you Jasmine7, but it seems like Yoyo either does not want children either, or she is playing along with what Ekin wants or don’t want. I hope he does not wait til they are both old, especially Yoyo, and then decide they want children. The chances of birth defects, the mother being in danger during the pregnancy and delivery are very possible. Whoa…this article was very poorly translated. The Chinese version is totally different from what is summarized above. In the original interview, Ekin explained his current position on having children and why he and Yoyo changed their minds about whether to have children or not….also, his position on in vitro fertilization is completely different from what is stated in the translation above as well. I recommend reading the original article in Chinese to at least get a better understanding of what was said. Of course, since the original article was from a tabloid, the info could still be ‘suspect’ (I actually found some discrepancies with the original article in Chinese), but at least it won’t be ‘lost in translation’…. Agree. The translation is very different from the original Chinese source. agree.jayne you should hire better writers this is not the first time that articles were tranlated wrongly.it is just too ridiculous. thank you ilwy for your alertness otherwise i will misunderstand ekin after reading this article! Thanks llwy12! Another good example of an article lost in translation. No wonder this article sound so boloney. “Although he is already 46 years old, Ekin’s popularity has not dies down. These journalists ready need a lesion in wisdom and common sense, not to mention one in journalistic etiquette. Since when does being in your 40s mean that your popularity will die down. God help these imbecilic rift raft. To have or nor not to have? They had better once and for all solve this question as time and tide wait for no man. It is funny how all of a sudden, no prior past or scandal is known about Yoyo Mung. I guess marrying an overrated Alister like Ekin can do that. Wipe the slate clean. All of a sudden, the only thing known about her involves a kid not feeling the love for her. This woman is well documented as a home wrecker, a notorious third partier., a gossiper, and one who had many problems with fellow actresses. Now all of a sudden , Yoyo has no past. Tsk, tsk, tsk. Like I said, marrying Ekin sure did a lot for her. It’s kind of funny how you have to point out her past. How is it relevant? Or how is that useful in any way? Every single person has a past and has done something they are not proud of. Are you a saint? You don’t have a past? Such a hypocrite with an arrogant attitude thy thinks you are better than everyone else. What is your f-ing problem Nyn???. Did I say I am a saint. I have lived a decent, honest life but that does nota saint. Only God is righteous and holy. Back off and shut up. I said what I said because someone said she has no scandal news. There is so much about her past that I was surprised this person who is so journalistically involved in articles did not know about such. Do you not read the threads, or do you just pick on me. Stuff your ignorant, fat ugly mug somewhere else. You are not wanted here. Oh and I await your nextpost. Please do not disappoint me. You are going through hell, I know, so many aliases Mandy first, now Tony. So many boy or girl names. I can send you the money to get your sexual reassignment surgery you know. While you are at it, get some plastic surgery to fix your face, your bad breath breath and some liposuction. Unfortunately, myself and my family cannot send you money to fix your character or morals, and we got a lot of money. No amount of money can fix that. Like I said, I am awaiting your next reply, make it good. I ORDER YOU NOT TO DISAPPOINTMENT ME. Reply my slave. I know you will reply. You might use one of your old aliases, or create a new one. Don’t think, Jayne, myself or many others here do not know that. Do you not realize that Jayne and her staff know exactly where on this earth you are posting from. Fool. Your master awaits your reply. Frankly I know very little about her. Did she has such a colourful past? Not that Ekin has a good clean slate for his past.